Available in two distinct model lines – SE and Sport – the M-Class looks better than ever. Design touches include a crenellated grille with three chrome trimmed louvres and a prominent central star. Clear lens projection-beam headlamps, a striking front bumper with integrated fog lamps, and a simulated underguard complete the bold front-end of the M-Class. Moving around the car, you’ll notice flared front wheel arches and a purposeful feature line sweeping towards the rear. Exterior door mirrors with a large reflective surface are automatically dimming as well as electrically folding. Roof rails are finished in black on the SE and in aluminium on the Sport. At the rear, dark-tinted tail lights and twin exhaust with oval tailpipes feature as standard on the V6 SE, with rectangular tailpipes in chrome fitted as standard on the V8 SE and all Sport models. The M-Class offers a choice of two superb diesel engines, each combining outstanding performance with impressive fuel economy. Consisting of the ML 300 CDI BlueEFFICIENCY and the ML 350 BlueEFFICIENCY, both powerful V6 units propel the M-Class from 0 - 100 Kmph in 8.3 seconds and 7.6 seconds respectively - a rapid pace for a vehicle renowned for its off-road capabilities. The engines both achieve a combined fuel economy of 32.5 mpg. The sole petrol engine of the M-Class, the V8 ML 500, puts breathtaking acceleration at your disposal. Its abilities are truly showcased with 388 hp (285 kW) of power and 530 Nm of torque. The ML 500 also accomplishes a stunning 0 - 100 Kmph time of just 5.8 seconds, whilst achieving 21.6 mpg combined. With seven forward gears and two “shifted” reverse gears, 7G-Tronic automatic transmission delivers outstanding response and incredibly smooth, quick gear changes on the M-Class. An electronic transmission control system ensures you’re always in the ideal gear for any driving situation, enhancing fuel economy, comfort and driving enjoyment. In addition, by reducing average engine speeds, it helps to minimise noise levels. For drivers who enjoy changing gear manually, the M-Class also features steering wheel-mounted gearshift paddles as standard. Heading into rough terrain? Simply hit the Off-Road button and the ESP® / 4ETS dynamic control system primes the M-Class for the challenges ahead. Traction and stability are maximised thanks to specially configured Off-Road ABS, which enables the front wheels to “dig-in” on difficult ground. Meanwhile, Off-Road ASR helps prevent the M-Class slipping on tricky surfaces such as gravel or scree. 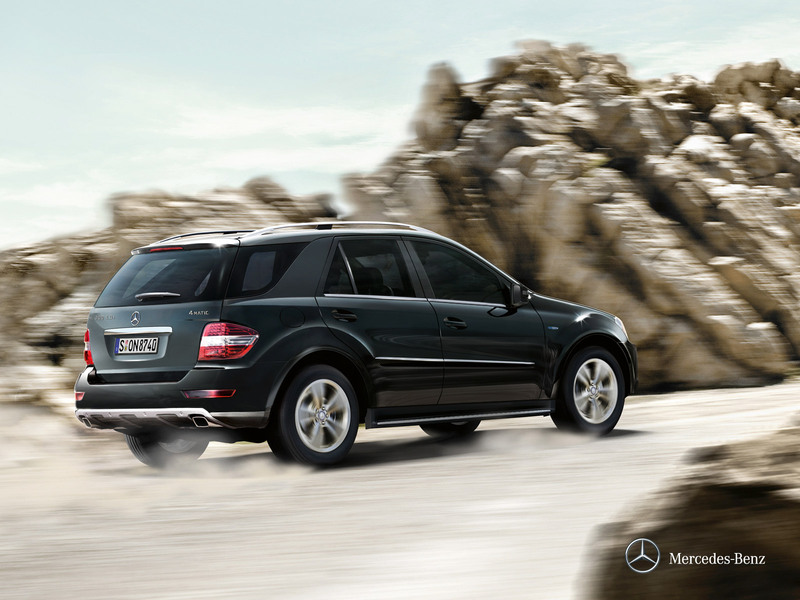 The optional Off-Road Pro Package further enhances the capabilities of the M-Class. With two-stage low range ratio gears, centre and rear differential locks and extended ground clearance adjustment range, it opens up a world of possibilities. The SE model features a striking grille in black with chrome-trimmed louvres, aggressively styled front bumper and clear glass projection-beam headlamps. The V6 version has 18” alloy wheels and twin exhaust with oval tailpipes, while the V8 features rectangular tailpipes in chrome. The V8 also includes 19” alloy wheels, chrome inserts in the side rubbing strips, a waistline trim strip in chrome and a chrome scratch guard on the load compartment sill. Both versions feature black roof rails and a simulated front underguard. Inside, you’ll enjoy sumptuous Artico artificial leather upholstery as standard along with Artico trimmed door panels, heated front seats and a new multi-function steering wheel with gearshift paddles. Burr Walnut wood trim is standard, while interior options include a further two wood trims to choose from, along with leather, two-tone leather and designo nappa leather upholstery. The standard SE specification includes rain-sensing wipers, automatically dimming rear-view and exterior mirrors, Easy-Pack powered tailgate and Parktronic front and rear parking aid. Sleek, athletic and seriously desirable, the M-Class Sport model is packed with eye-catching new design touches. We’ve fitted as standard distinctive 20” alloy wheels, aluminium-finish running boards with rubber studs, aluminium-finish roof rails, and simulated front and rear underguards in stainless steel. Other stylish exterior features include the sterling silver radiator grille with chrome trim, and the rectangular chrome tailpipes integrated into the simulated underguard. Privacy glass adds an extra air of exclusivity. Chrome detailing also features on the waistline strip and the scratch guard at the edge of the load compartment sill. Continuing the car’s premium, sporty feel, the interior has Alcantara / Artico artificial leather upholstery with front sports seats. designo nappa leather can also be ordered as an option. Racing style instrument cluster and brushed stainless steel pedals with rubber studs enhance the aluminium interior trim. The Interior Lighting Package, fitted as standard adds to the cabin ambience. The standard Sport specification has also now been enhanced with convenient features including rain-sensing wipers, automatically dimming rear-view and exterior mirrors, Easy-Pack powered tailgate and Parktronic front and rear parking aid. Inside the M-Class we’ve taken luxury to new levels, with exquisite materials and superb finishes throughout. While specific design details depend on the model line, indulgent new touches include Artico artifical leather-trimmed door panels and piping on the redesigned seats. There's a range of colour schemes and trim options to choose from, including two-tone leather upholstery and a dashboard trimmed in designo nappa leather. A newly designed leather multi-function steering wheel with chrome trim gives you easy control of a range of functions, with gearshift paddles as standard. All models now feature heated front seats, and communications equipment has been updated. For example, the Bluetooth® interface is now standard, enabling you to make easy hands-free calls. 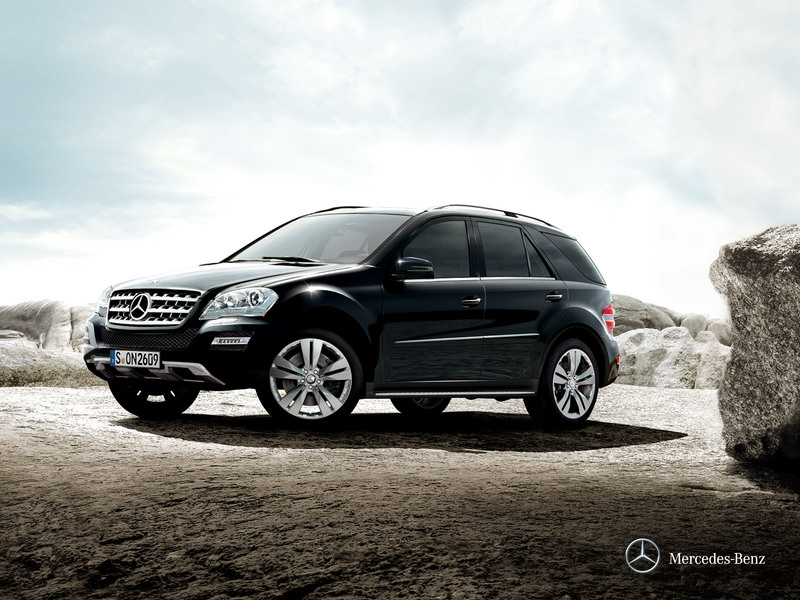 Exceptional comfort has always been a hallmark of the M-Class. In this latest version, the front seats feature 4-way electric lumbar support as standard, ensuring you arrive at your destination relaxed and alert. On those cold winter mornings, heated front seats are another welcome addition. Options include the Memory Package, which ‘remembers’ individual seat settings for the front seats, plus exterior door mirror settings and steering column settings. ML 63 AMG. Or, if you prefer, you can choose the optional two-tone leather on the SE or select the optional designo nappa leather on the SE and Sport. The M-Class includes automatic climate control as standard, helping maintain a pleasant temperature inside the car at all times. Optional multi-zone luxury automatic climate control (standard on ML 500) goes further, enabling you to select individual temperature and airflow settings for the driver, front passenger and rear passengers. The system is able to monitor the angle of the sun’s rays and adjust temperature and airflow accordingly. In addition, it monitors outside air quality and filters it if required. The multi-function steering wheel on the M-Class features racing-style gearshift paddles as standard alongside the Direct Select lever for fast, easy gear changes. A range of other functions can be performed using integrated thumb controls – from changing radio stations and making calls in conjunction with the standard Bluetooth® interface, to calling up information in the instrument cluster. Where Audio 50 or the COMAND multimedia system is specified, Linguatronic voice control can also be activated through a button on the steering wheel. Blissfully easy to use, the new multi-function steering wheel exudes quality, with nappa leather trim and chrome insert as standard. The price of Mercedes ML 300 is RS 3520048.9 (excluding tax) and ML 350 is Rs 3694531.4 (excluding tax). Thanks Virginia H.Underhill for your love for Dwheels.blogspot.com , you can join us on facebook on Dwheels.blogspot.com page. I'm extremely impressed with your writing skills and also with the layout on your weblog. Is this a paid theme or did you customize it yourself? Anyway keep up the nice quality writing, it is rare to see a great blog like this one nowadays..